This Album gives an impression of Brooks Range conditions through the seasons. On this trip we drove from Fairbanks to Dawson City. Then we caught a charter flight on a Twin Otter to Inuvik, NWT Canada. Then on to Mould Bay on Prince Patrick Island and a couple of attempts at getting into Isachsen on Ellef Ringnes Island. We never made it into Isachsen because of the fog. Then on to Green Cabin on Banks Island. This Album was created during a field trip in August of 2008 to the towns of Kangerlusuaq, Illulisat, Sisimiut and Nuuk. Experiments using the Phased Array L-band Synthetic Aperture Radar (PALSAR) of the Advanced Land Observation System (ALOS), JAXA, from 2006 through 2011. This album contains images from Guido's expedition to the Kolyma region, Northeast Siberia, in August 2009. Our small group from UAF and Russian partners from Moscow State University and the North East Science Station worked around Cherskii and by boat and all-terrain vehicle around Cape Maly Chukochy, about 70 km northwest of the Kolyma river mouth. We collected sediment samples from permafrost exposures on bluffs along rivers, lake shores and coasts to study how old thermokarst lakes are in the region, how they form, and what their sedimentologicla and biogeochemical (i.e. This is a collection of patterned ground images from Ina Timling and Ronald Daanen. We encountered these sites on our expeditions to Northern Alaska, Northern Canada, Rusia and Svalbard. This album contains images from Guido's expedition to the Seward Peninsula, Alaska, in June 2008. We worked in the Cape Espenberg lowland around the Kitluk river mouth, based out of a nice little camp. Together with four colleagues from the Alfred Wegener Institute for Polar and Marine Research Potsdam, Germany, and one from the Senckenberg Institute Weimar we sampled permafrost sediments and ground ice in coastal exposures, surveyed recent plant communities and ostracod fauna, and did geophysical surveys of permafrost sediments. 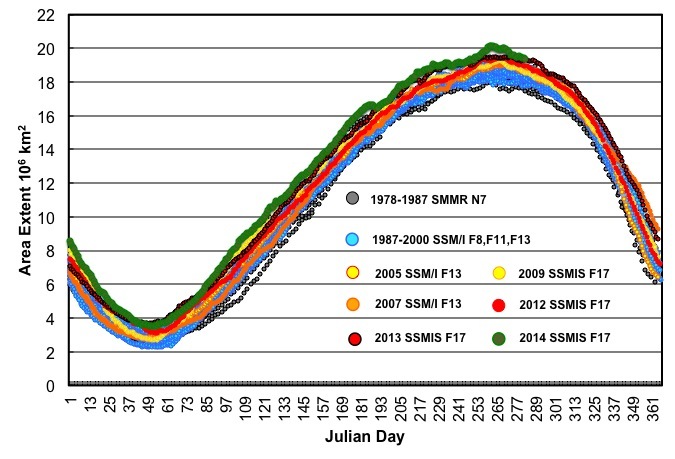 Plot of the daily area extent derived over the satellite period of Southern Ocean sea ice surrounding Antarctica. Images from meetings and places like Svalbard.